Additional Info: My name is Edina Pastyik from North Dallas, Texas. I was born in 1974 in Budapest, Hungary, to a very musical family. My grandfather was a church organist, and my father played the piano. My mother sang at the Hungarian National Opera House as the leader of the alto voice section for 35 years. 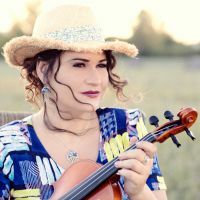 My older sister followed the footsteps of my mother and became a professional opera singer and still performs at the Opera House, while I chose the violin at age six. I studied at the Bela Bartok Conservatory and the famous Franz Liszt Music Academy in Budapest where I received my two Masters Degrees in 1999: Masters of Violin/Viola teacher and Masters in Chamber Music Performance. In 2006 I completed my studies at SMU (Dallas) where I received my Artist Certificate. I started my teaching career in Budapest then continued in South Korea, Japan, and currently I’m an instructor in the Richardson Independent School districts and I have a private studio at home. I offer violin and viola private lessons in my well-equipped home studio between ages 5 and 99.